You may print the worksheet at the bottom of this post. The body is like a skinny teardrop with a little head on top. There are short wing feathers going down from the side. The head has some feathers sticking out of the top like a crown. The beak is long and white. The eye is small and has a white area around it and a black area around the white area. The legs are skinny. The tail feathers take time to do nicely so be ready to work on them for a while. Start with some guidelines to keep things even. Draw these lightly so you can erase later. Make the guidelines like five or six arches going over the body. On the guidelines draw the eyes of the tail feathers. The eyes look like teardrops with a dot and a smile. Keep them the same size and space them evenly along the guidelines but not too close together. There is a bunch of feathers at the base of the tail, draw these like half circles going up from the body. Starting with the eyes closest to the body draw the stem of each feather going from each eye to the body, use a line for each side of the stem. On the stems are fine hairs that go out draw these as short light lines. 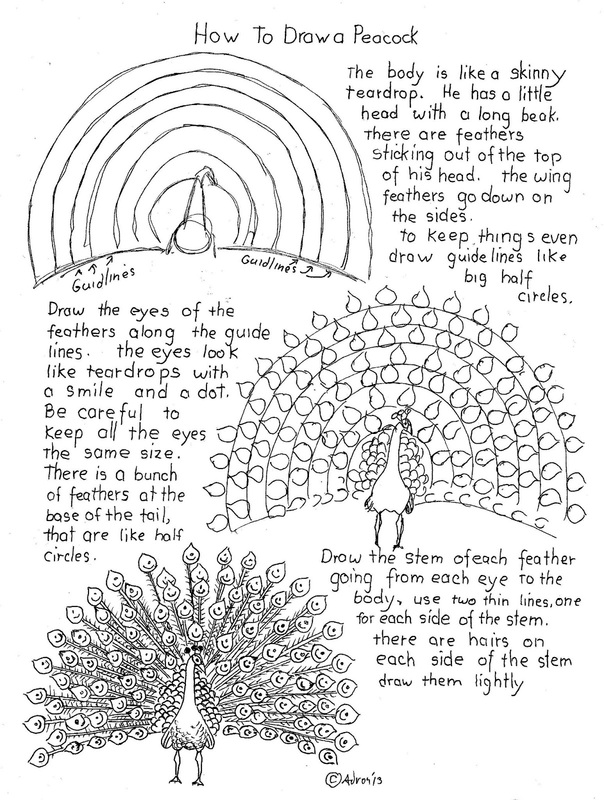 How to Draw a Peacock Worksheet. ____________________________________________________________ Feel free to print a few worksheets for your own use. Thank you for your gift.